Figuring out how to add battle damage to metal armour (or unpainted armour) can be confusing for some folks. The main reason is that the method we often use to represent battle damage on normal (painted) armour will not work here. We have to alter our normal method slightly. The process remains the same as it would be for adding damage on painted armour. We add the light color first and then offset the dark color (slightly higher for overhead lighting) on top of the previous color. This gives the impression that there is a chip or dent in the surface of the armour. It's another faux painting trick we use to convince the viewer without actually having to damage our models. By leaving that very thin line of white along the lower edge, it simulates the overhead light being reflected off the lower portion or lip of the battle damage. The key to this whole thing is in the two colors and the sequence. Instead of a lighter shade of our armour color, we're going to use white. We want the thin line that's left over to pop and it's going to take white over the metal to make it show up. Our other color is black. You could use a dark grey color if you wanted, but make sure it's almost black since you don't want it being confused for just another shadow or a stray mark on the model. The first color to go down needs to be the white. By putting the white down first, you can add the black right up the edge of it leaving only the tiniest sliver showing. It's much easier to get a thin line of white in this manner than it is to paint the black first and then try and add the white along the remaining edge. You really do need that sharp, irregular edge of white to make this look convincing. And that's it, simple as that for adding damage to plain metal. Now there are things you can do to dress this up even more, but this is a great start and will work perfectly for tabletop models. And remember, when it comes to adding battle damage on a model, less is more! hey .. very usefull! have been dealing with this thing wodering a nice way to damage a metal armour for a display model..if i didn´t have the model finished id try that .. next time will be! Really useful, and intuitive, tip! Glad you like it guys. Remember, less is more when it comes to this stuff and scale is important. It doesn't have to be huge chunks of damage. Even the slightest of indications will be "interpreted" as damage. Especially with the black and white. Anon: Good question about black armour. Lots of times you see folks doing just that... adding a little bit of silver to the edges. That works perfectly fine too. You can vary the silver or metal you use to give the impression of new and old chips/dents. By using something like bultgun metal (something darker) you indicate older damage. By using a brighter silver, you can indicate newer damage and wear and tear. You can add another color like a maroon or orangish red color to indicate the "primer" color that was applied before the black paint was. Then it becomes a matter of indicating surface damage vs deeper damage that goes down to the metal itself. Let me put a post together to show you what I mean. Very nice tutorial. Thanks for the step by step on how to do it. 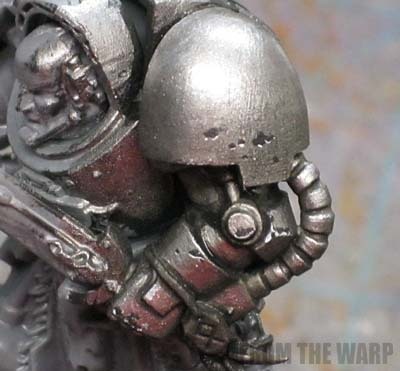 On a related note, if you're too lazy or to clumsy to use this way of adding battle damage, the new Nuln Oil wash considerably darkens a metal surface. Afterwards, you can add your battle damage in a lighter metal colour and it will read as battle damage reasonably well against the darker background. 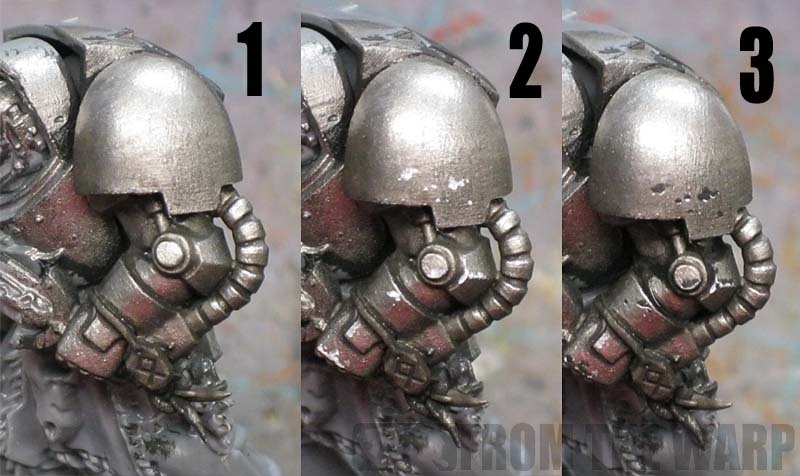 Great tutorial Ron, I'm going to have to paint something metallic just to try it out! Love the way you break it down so even painters with a lower skill level like myself can have a go at it. Thank again, keep those tutorials coming! Great tutorial - best painting blog on the net! KrautScientist: I know what you mean. I applied the new Nuln Oil shade to this armour and noticed the same thing. It darkened the whole thing down considerably. I'll need to be more careful in my application next time and keep it to the recessed areas only. KrautScientist Good point. I tend to use my washes/shades in the recessed areas only. With it being darker, I wonder if thinning it will get a more "Badab Black" look. Very helpful indeed. Will use this for my astral claws, I was stuck wondering how to do battle damage on them. I´m not fan of battle damage but this looks great! That's very convincing. I thought for a moment it was a picture of a metal model with real scratches. Congrats! Silar Lannanaris: I'm glad this helps you Astral Claws folks too. Irinyir and Kevin: Thanks guys, glad it helped!